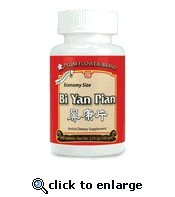 Bi Yan Pian - 600 tablets | Wing Ming Herbs, Inc. Functions: Disperses Wind, Clears Heat, Expels Toxins, Transforms Phlegm, Unblocks the Nose Indications: Sinus conditions, especially with thick, yellow discharge. Standard Dosage: 3-4 tablets, 3-x day. Ingredients: Xanthium sibiricum fruit, Magnolia denudata flower, Forsythia suspensa fruit, Ledebouriella divaricata root, Angelica dahurica root, Anemarrhena asphodeloides rhizome, Glycyrrhiza uralensis root, Schizonepeta tenuifolia herb, Chrysanthemum indicum flower, Schisandra chinensis fruit, Platycodon grandiflorum root. 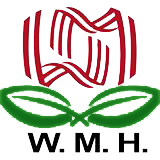 – Cang er zi, Xin yi hua, Lian qiao, Fang feng, Bai zhi, Zhi mu, Gan cao, Jing jie, Ye ju hua, Wu wei zi, Jie geng. Cautions &amp; Contraindications: Use with caution during pregnancy.